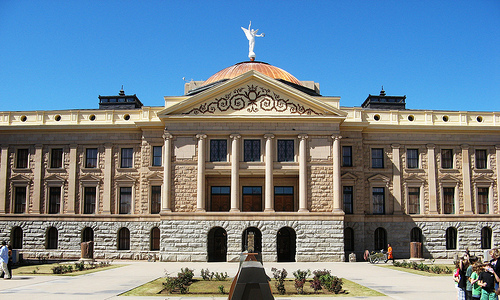 The last few weeks the Arizona Legislature has been working on trying to pass the state’s budget. Two weeks ago I heard about a protest march at the capital to try and put a stop to deep cuts in education funding. At that time, I didn’t find out about the march until the day my friend posted pictures of it happening. As a result, I was unable to participate. Budget talks continued and a second march, which was communicated more effectively and created with more advance notice, occurred. This time, I took the initiative to participate. This was my first protest march since college and it was a great experience. To see everybody getting together to fight for a common cause was tremendous. To cause our legislators to actually come out of their holes to watch the light of the people shine bright was amazing. As always, there is concern that marches such as this may fall on deaf ears. I relished in chanting “SOS, Save Our Schools!” and my favorite, created by both ASU and UofA students,… “There ain’t no power like the power of the students, and the power of the student don’t stop, say what! !” Okay, so the grammar isn’t perfect but the point is. Fast forward to last night. The legislators took the sneaky move of having discussions to finalize the budget late on a Friday evening. They went to the hearing rooms hoping that the shields of darkness would protect them like armor. Amazingly, the power of the people couldn’t be completely eclipsed. Many of the protest leaders took to social media and encouraged individuals to go to the Capitol Building to show their presence and prove that the public won’t go gently into the goodnight and WILL ALWAYS be listening. I myself, decided to stay home and watch the stream of the budget bill debates online. Knowing it would most likely go all night and my wife and daughter having plans in the morning, I choose the next best thing to being there in person. I watched it stream until 1am. I woke up at 8am eager to read the results on social media. To my amazement, the House was still working to pass the last bill necessary to approve the budget. The end result was a slightly better yet very disappointing budget. They went from a K-12 education cut to a slight K-12 slight, with very little limitation on how that extra money is spent. Higher education funding was gouged and prisons received increased funding. In the end, very few other financial adjustments were made from the original budget presented by our governor.